Hades was the ruler of the Underworld, son of Cronus and Rhea and brother of Zeus and Poseidon. His name is believed to derive from Aidoneus, or Unseen One, from the ancient root Fid or idein (to see). 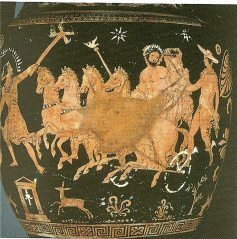 In the Iliad, Homer mentions that the king of Darkness had a magic helmet or kyne, made from the hound of a dog (kyn in ancient Greek). This helmet, which made his wearer invisible, was a gift given to the ruler of the underworld from the Cyclopes, to help him and his brother Zeus overpower the Titans. The god figures in one of the most well known myths of Greek Mythology, the myth of Persephone, daughter of goddess Demeter. 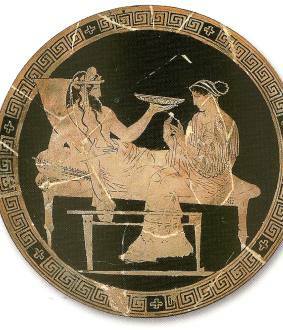 Click here to learn more about the myth of Demeter and Persephone. Unlike his divine siblings, Hades did not have many romantic adventures. Mythology only mentions one affair with the nymph Menthe whom Persephone and Demeter relentlessly pursued and killed. After she was dead, her lover the king of darkness turned her into a plant, the mint. On another occasion, Leuce, Oceanus's daughter is mentioned as the god's lover. When she died, she grew into a silver leafed poplar-the tree that grew in the Elysian fields. According to Mythology, Elysian Fields refers to the mythical section of the Underworld, where the souls of the heroes and the mortals who had led a virtuous life, were resting in eternity. Hercules, during his trip to the Underworld, made a wreath from the poplar's branches which he wore when he came back to the world of the living. Merciless, tough, untamed, unemotional, hated but rich and powerful from the souls of the dead, Hades was the great judge of mortals, when facing their unescapable fate. He was often honored with god Dionysus and there are various versions about the exact location of his kingdom. According to the Iliad, he lived beneath the earth, while in Odyssey he is said to live beyond Oceanus in the land of the Cimmerions, which is bounded by the rivers Acheron, Pyriphlegethon, Cocytus, and Styx. The gates of the Underworld were guarded by the monstrous dog Cerberus, who had three (or, by other accounts, fifty) heads with which he devoured whoever dared reach his master's palace. The ancient Greeks identified several locations with the entrance to the god's underworld kingdom. These places usually featured openings in the earth and included Taenarum in the southern Peloponnese, Lake Acherousia, Kymi, or Hippius Colonus in Athens.